This print is from the series 'Ten Romances of the Honchō Circle' (Honchōren monogatari jūban). It is from 'The Tale of the Woodcutter' (Taketori monogatari) written in the 9th or 10th century. "An old woodcutter finds a stalk of bamboo emitting light. He cuts it open and discovers a tiny girl, who he and his wife adopt. The child grows up to be a beautiful woman, and is called Kaguya Hime, 'The Shining Princess'. Many suitors from the court come to ask for her hand, but she gives them impossible tasks to perform, in which they all fail. Eventually the emperor himself asks for her hand, but she is from Heaven and returns there accompanied by a host of other celestial beings before the marriage can be arranged. One of her suitors, Prince Koremochi, was required to bring a jewelled golden branch of a tree that grows on Mt. Hōrai on the Island of the Immortals. In Gakutei's picture the aged woodcutter is presenting his daughter with a plum branch, which the poet indicates is far preferable. Quoted from: The Art of Surimono: Privately published Japanese woodblock prints and books in the Chester Beatty Library, Dublin by Roger Keyes, vol. I, p. 75. There is also a small black and white illustration. The suggestion that this surimono may have appeared in 1819 makes sense for a number of reasons: 1) 1819 is the year of the hare; 2) the hare is a creature which lives on the moon and pounds rice to make mochi, a New Year's traditional food - in Chinese lore he pounds the elixir of eternal life; 3) Kaguyahime is the moon goddess come to earth; 4) in one version of this story the Emperor pursues her after he hears of her beauty. She declines to be with him but gives him an elixir which would bestow eternal life on him. 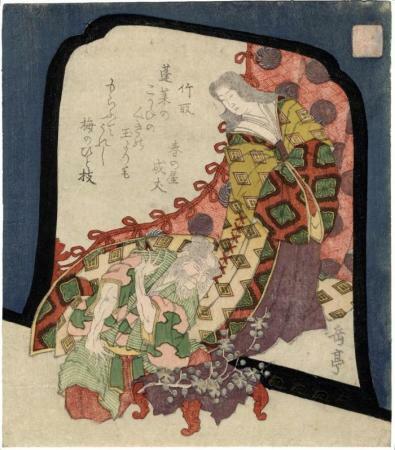 The Emperor declines to drink it once he realizes that Kaguyahime will not stay with him; 5) using the enlargement tool for this print, look closely at the decorations along the lower right edge of the black frame she is encased by, even though her gown flows out on the left behind the woodcutter. Enlarged you will see what appear to be four hares seen in profile. There is another hint as to the meaning of this print. The woodcutter is looking at a beautiful sprig of flowers and leaves printed in silver. The Emperor, knowing that she would not agree to marry him, sent Kaguyahime poems attached to beautiful flowering sprigs.